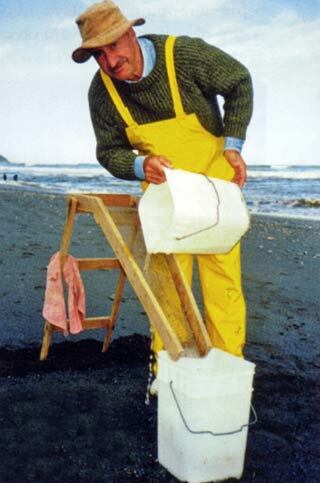 Richard Hunter dragging in the surf at Okarito. All the locals, as well as ourselves, were hoping for that West Coast whitebait run we all hear about but so few have experienced. It’s 5.30am, Saturday 9 October. 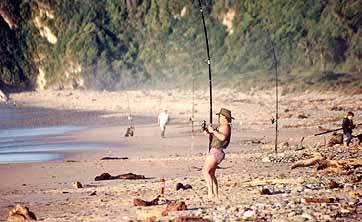 I’m sitting in the lounge finishing a cup of coffee, mentally ticking off everything required for our annual whitebaiting trip to Okarito. Jim Dunlop putting the wriggle board to good use. Leaving time from my place of 6.00am and in 13 years Richard Hunter, Jack Banks, Tony Thomas and Jim Dunlop have never been late to collect me and leave as planned. Sure enough, 5.45am and Richard drives around the corner, we load up the last of the supplies, goodbye to Anne and we are away on time. It’s a beautiful day, cloudless with no wind. Soon the eastern horizon starts to lighten up, but there is a fog bank which we don’t run out of ‘til Springfield. Up over Porters Pass and on to Klondyke Corner. This is the traditional stop for breakfast which is prepared the night before by Richard and Tony. They are now famous for their traditional Cornish pasties with all the ingredients diced before wrapping in pastry and cooking. A cup of coffee and we are on our way again. We stop and look at the new viaduct then on to the coast. The first thing we look at when we reach the coast is the condition of the sea. Hopefully, it will be calm, but this time it’s rough. Not a good sign for the first few days of whitebaiting. Turn left through Hokitika, Ross, Harihari and across the Poerua river bridge, wondering if the earth dam caused by a massive slip on Mt Adams will hold ‘til we get across. It does. Down to Whataroa, fill up Richard’s Chrysler Jeep, Grand Cherokee then on to our destination for a week’s whitebaiting at Okarito, arriving at 11.00am. 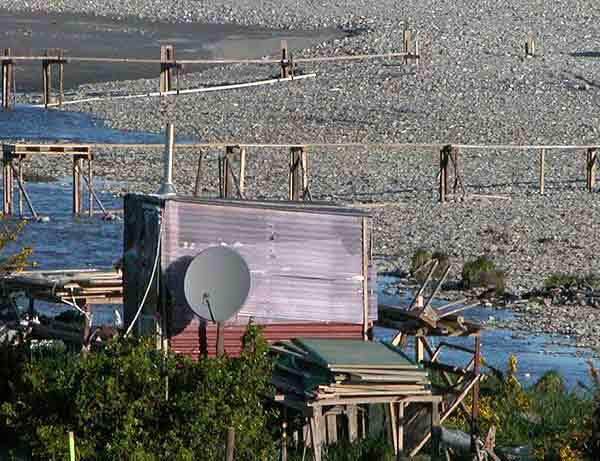 After packing away our gear etc., our first call is over the road from the Okarito Motel to Kit Green’s place. 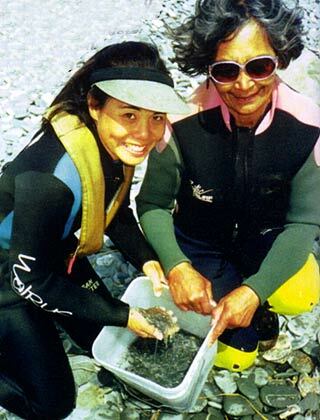 Kit lives at Franz Iosef but has a house at Okarito where she stays for the whitebait season. Each year on the day we arrive Kit has our lunch ready which consists of an oven dish filled with fresh whitebait patties. This year her sister, Mary, was staying with her. On Saturday night one of the locals, Mike Yates, had an evening to celebrate his big 50! It was really good to catch up with everyone and by the time we went to bed none of us took much rocking. A good catch by local Sue Yates (left) and Christchurch visitor Joy Nicholls. Sunday morning up early. Breakfast, pack thermos’ and something to eat. 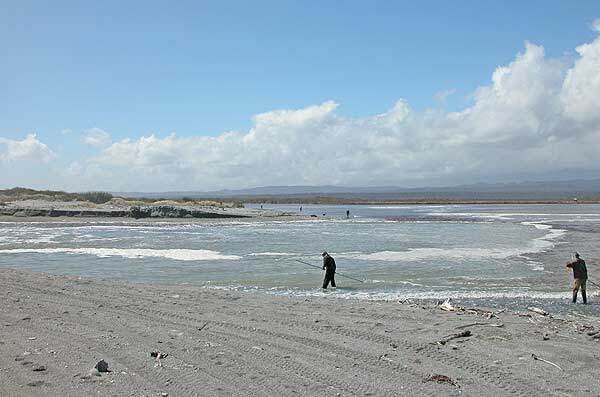 Put the nets and the wriggle board onto the trailer and down to the Okarito lagoon mouth, as usual hoping for that run of whitebait that everyone talks about, but in all the years of tackling and dreaming has managed to elude us. It’s the same with all fishing — ”you should have been here yesterday/ last week etc”. Sunday turned out not to be the day of dreams. 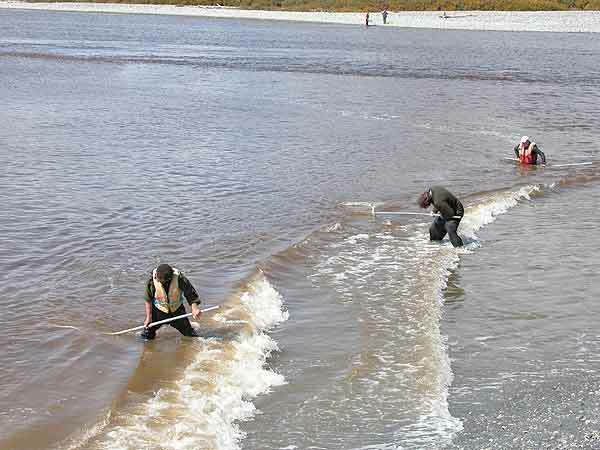 After five hours fishing in the surf and once upriver, the tide started pushing back. We only had about two kilograms. This, however, we were more than happy to take back to the motel and put in bags of 250gms to freeze. Monday, Tuesday and Wednesday all became a repeat of Sunday with Richard, Jack, Tony and myself dragging and Jim doing the cleaning on the wriggle board. Thursday dawned still and fine and from the motel, we could only just hear the surf breaking. Maybe this is the day, but no. However, the catch for the day was up on the previous four days. 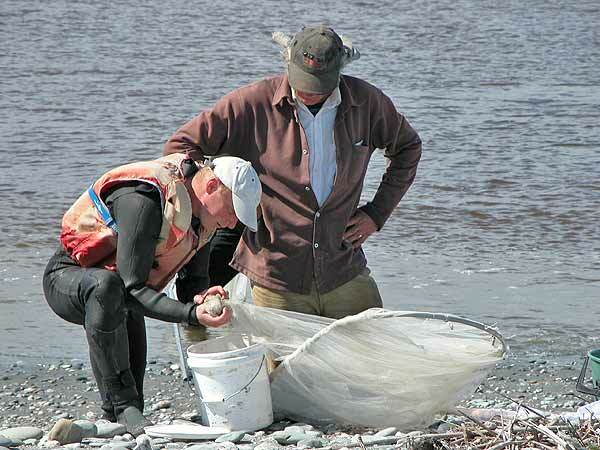 Next day, Friday, the surf had gone down completely and again we caught more than on Thursday. 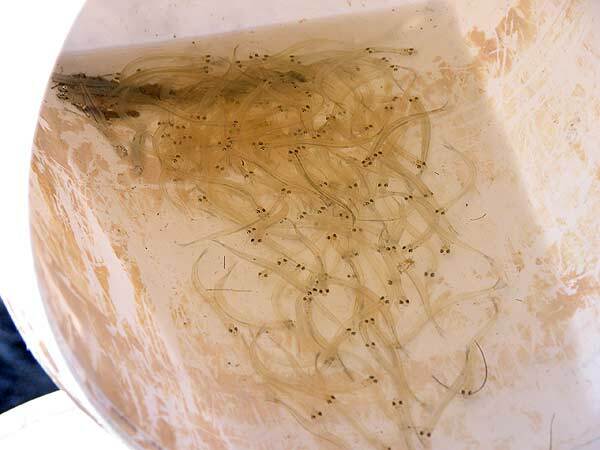 All the locals, as well as us, were hoping for that West Coast whitebait run we have all heard about but so few have experienced. Friday night we always have an open home with all of the locals, approximately 14 of them, plus the influx of whitebaiters from the camping ground, around for a potluck tea. 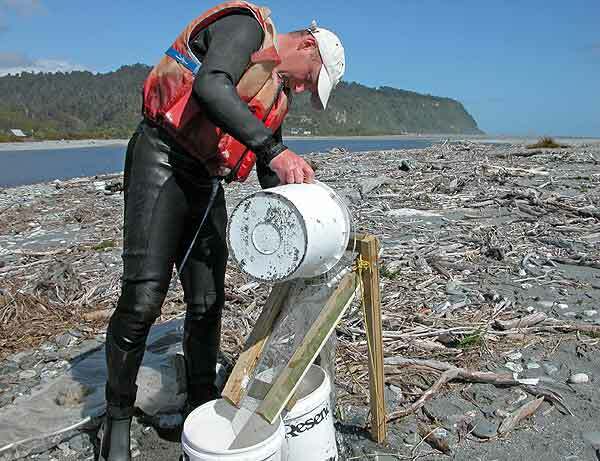 Invariably we all got around to talking whitebait and maybe tomorrow will be the day of the big run. We all hoped so as we were heading home on Sunday morning. When we awoke on Saturday it was a beautiful day, clear blue sky, not a breath of wind and the snowcapped mountains as a glistening backdrop. Once again load the nets into the trailer and off to the river mouth. The tide was still low and hadn’t started to make, however being keen we started to drag along the shore which was the calmest we had seen in all the years we have whitebaited there. I led off with Tony and Richard close behind. Jack had decided to have another cup of tea before walking down to join us. After dragging about five metres I lifted my net and yelled to Richard and Tony to take a look as the whitebait were running down the inside of the net and joining the already respectable sized catch sitting at the foot of the net. 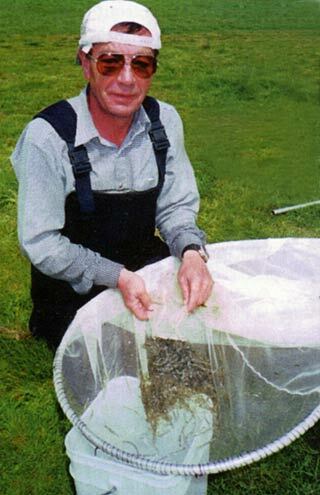 Richard Hunter with a good “pudding” of whitebait. Both Richard and Tony lifted their nets to be greeted with a repeat performance of mine. 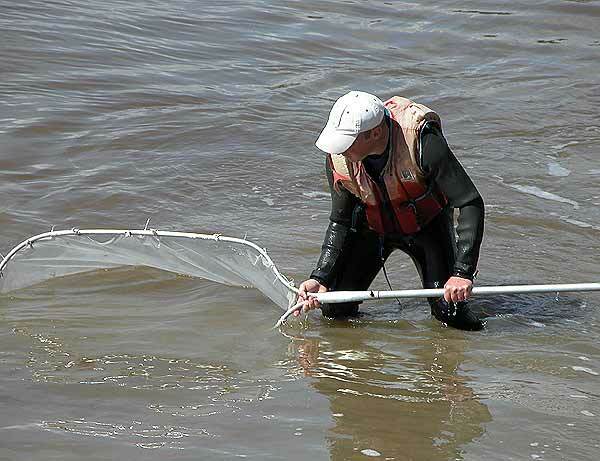 Jim, seeing our excitement, grabbed one of his buckets and came down to us so we could empty the whitebait for him to start putting them across the wriggle board to remove any smelt, cucumber fish, leaves, etc. Well, that was the start for the day and it only got better over the next four to five hours. One time I was following Richard, only about three metres behind, when he lifted his net with the biggest catch we saw for the day — estimated at about 5-6lbs. I say estimated because none of us wanted to stop and weigh any to confirm. 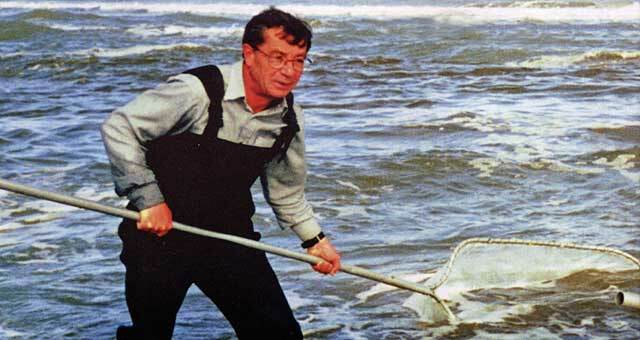 Jim was kept flat out cleaning and he reckons we were emptying into his buckets in lots of one pound or more, but none of us were able to head off Richard’s catch. 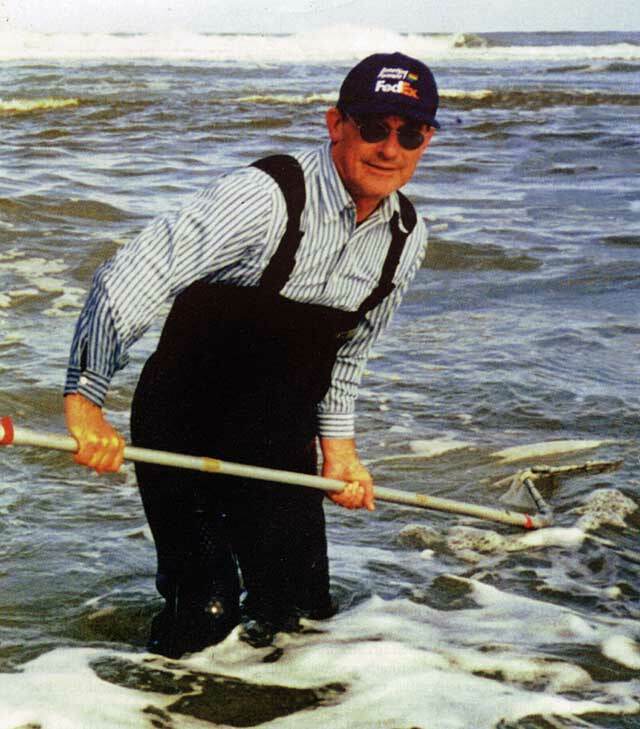 I was inventive but the tide was rising past the area we can fish. The bait just stopped as though someone had turned off a tap, but none of us were too disappointed as we were starting to ache across the shoulders, arms and back, as any of you who have been in a West Coast run will know. It was great to get back to the motel, knock off a few tinnies and put our feet up before dinner. The five of us were all on a high which lasted most of the evening. Next morning we packed up and left for Christchurch, knowing at last, after 13 years, we can say “Remember that time at the Okarito when. ..! 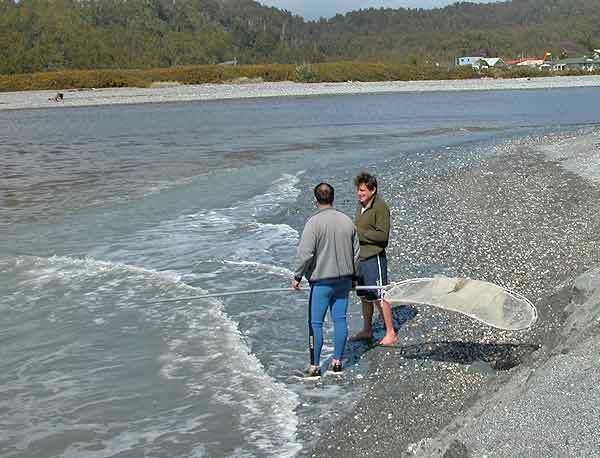 Tony Thomas dipping his scoop net in the Okarito surf. 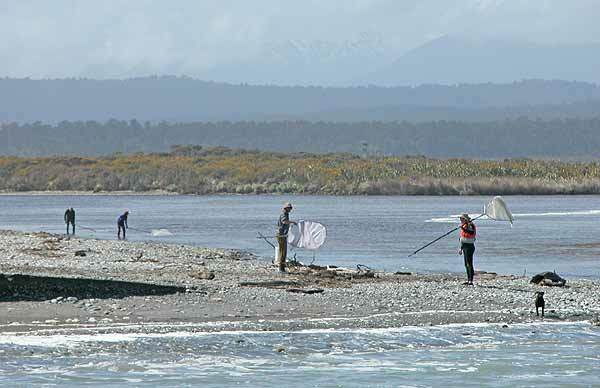 In the video below: Fishingmag.co.nz editor Allan Burgess whitebaiting with a pole net at the mouth of Canterbury’s Waimakariri River. 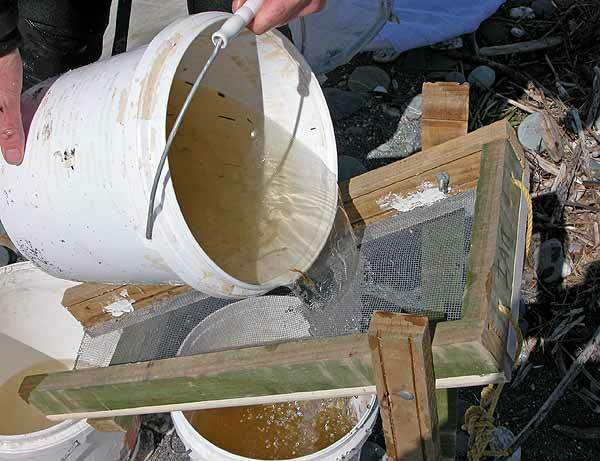 The best whitebait fritters recipe. Mokihinui Gentle Annie Beach. 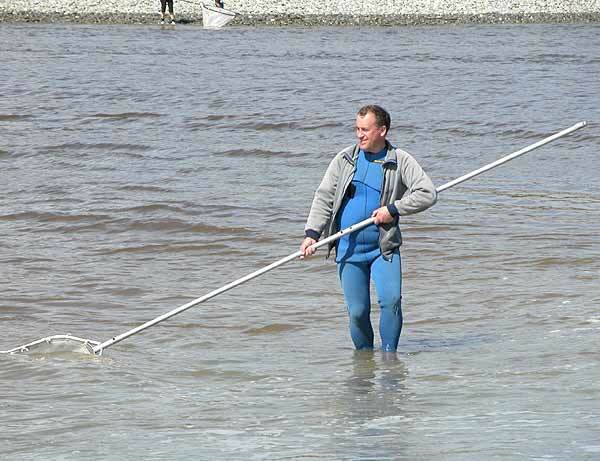 There is good deep water close to the beach.